ab5802 detects silencing mediator of retinoic acid and thyroid hormone receptor (SMRT) from human cells. Fusion protein corresponding to Human NCOR2/SMRT aa 95-565. Steroid and thyroid hormones and retinoic acid regulate a complex array of gene expression activity via intracellular receptor transcription factors belonging to the ligand-dependent nuclear receptor superfamily. Adding to the complexity of function of these transcription factors are associated proteins known as coactivators and corepressors which, as their names suggest, enhance or depress transcription activity of the nuclear receptor with which they associate. Silencing mediator of retinoic acid & thyroid hormone receptor (SMRT) and nuclear receptor corepressor (N-CoR) are related transcriptional corepressors which contain two distinct domains capable of interacting with unliganded nuclear receptors to repress their basal transcriptional activity. Our Abpromise guarantee covers the use of ab5802 in the following tested applications. WB Use a concentration of 4 µg/ml. Detects a band of approximately 250 kDa (predicted molecular weight: 302 kDa). Transcriptional corepressor of NR4A2/NURR1 and acts through histone deacetylases (HDACs) to keep promoters of NR4A2/NURR1 target genes in a repressed deacetylated state (By similarity). Mediates the transcriptional repression activity of some nuclear receptors by promoting chromatin condensation, thus preventing access of the basal transcription. Isoform 1 and isoform 5 have different affinities for different nuclear receptors. Ubiquitous. High levels of expression are detected in lung, spleen and brain. The N-terminal region contains repression functions that are divided into three independent repression domains (RD1, RD2 and RD3). The C-terminal region contains the nuclear receptor-interacting domains that are divided in two separate interaction domains (ID1 and ID2). The two interaction domains (ID) contain a conserved sequence referred to as the CORNR box. This motif is required and sufficient to permit binding to unligated TR and RARS. Sequences flanking the CORNR box determine nuclear hormone receptor specificity. 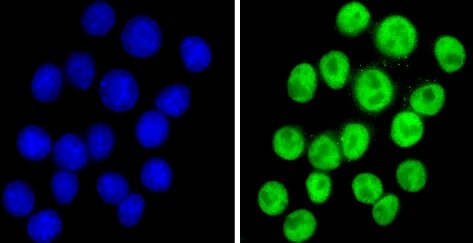 Immunofluorescent analysis of NCOR2/SMRT (green) showing staining in the nucleus of U251 cells (right) compared to a negative control without primary antibody (left). Formalin-fixed cells were permeabilized with 0.1% Triton X-100 in TBS for 5-10 minutes and blocked with 3% BSA-PBS for 30 minutes at room temperature. Cells were probed with ab5802 in 3% BSA-PBS at a dilution of 1:100 and incubated overnight at 4 ºC in a humidified chamber. Cells were washed with PBST and incubated with a DyLight-conjugated secondary antibody in PBS at room temperature in the dark. F-actin (red) was stained with a fluorescent red phalloidin and nuclei (blue) were stained with Hoechst or DAPI. Images were taken at a magnification of 60x. 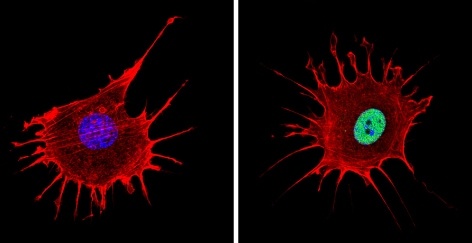 Immunofluorescent analysis of NCOR2/SMRT (green) showing staining in the nucleus of NIH-3T3 cells (right) compared to a negative control without primary antibody (left). Formalin-fixed cells were permeabilized with 0.1% Triton X-100 in TBS for 5-10 minutes and blocked with 3% BSA-PBS for 30 minutes at room temperature. Cells were probed with ab5802 in 3% BSA-PBS at a dilution of 1:100 and incubated overnight at 4 ºC in a humidified chamber. Cells were washed with PBST and incubated with a DyLight-conjugated secondary antibody in PBS at room temperature in the dark. F-actin (red) was stained with a fluorescent red phalloidin and nuclei (blue) were stained with Hoechst or DAPI. Images were taken at a magnification of 60x. 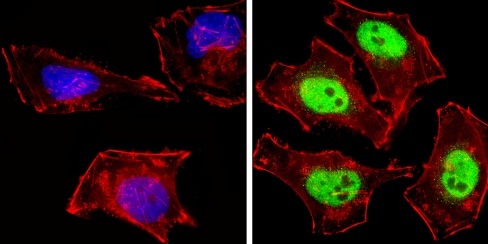 Immunofluorescent analysis of NCOR2/SMRT (green) showing staining in the nucleus of Neuro-2a cells (right) compared to a negative control without primary antibody (left). Formalin-fixed cells were permeabilized with 0.1% Triton X-100 in TBS for 5-10 minutes and blocked with 3% BSA-PBS for 30 minutes at room temperature. Cells were probed with ab5802 in 3% BSA-PBS at a dilution of 1:150 and incubated overnight at 4 ºC in a humidified chamber. Cells were washed with PBST and incubated with a DyLight-conjugated secondary antibody in PBS at room temperature in the dark. F-actin (red) was stained with a fluorescent red phalloidin and nuclei (blue) were stained with Hoechst or DAPI. Images were taken at a magnification of 100x. 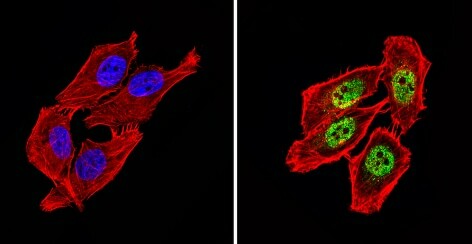 Immunofluorescent analysis of NCOR2/SMRT (green) showing staining in the nucleus of Hela cells (right) compared to a negative control without primary antibody (left). Formalin-fixed cells were permeabilized with 0.1% Triton X-100 in TBS for 5-10 minutes and blocked with 3% BSA-PBS for 30 minutes at room temperature. Cells were probed with ab5802 in 3% BSA-PBS at a dilution of 1:150 and incubated overnight at 4 ºC in a humidified chamber. Cells were washed with PBST and incubated with a DyLight-conjugated secondary antibody in PBS at room temperature in the dark. F-actin (red) was stained with a fluorescent red phalloidin and nuclei (blue) were stained with Hoechst or DAPI. Images were taken at a magnification of 100x. 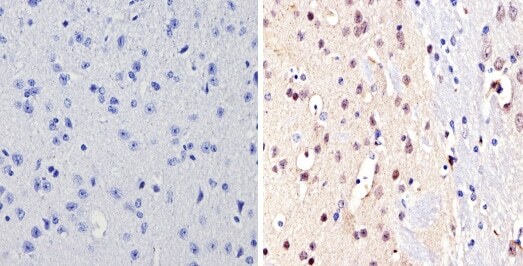 ab5802 labelling NCOR2/SMRT in mouse brain tissue (right) compared with a negative control (left) by Immunohistochemistry (formalin/PFA-fixed paraffin embedded sections). Antigen retrieval method was performed using 10mM sodium citrate (pH 6.0) microwaved for 8-15 min and tissues were blocked in 3% H2O2-methanol for 15 min at room temperature. Tissue sections were incubated with primary antibody (1:500 in 3% BSA-PBS) overnight at 4°C. A HRP-conjugated anti-rabbit was used as the secondary antibody, followed by colorimetric detection using a DAB kit. Tissues were counterstained with hematoxylin and dehydrated with ethanol and xylene to prep for mounting. ab5802 labelling NCOR2/SMRT in human lung tissue (right) compared with a negative control (left) by Immunohistochemistry (formalin/PFA-fixed paraffin embedded sections). Antigen retrieval method was performed using 10mM sodium citrate (pH 6.0) microwaved for 8-15 min and tissues were blocked in 3% H2O2-methanol for 15 min at room temperature. Tissue sections were incubated with primary antibody (1:500 in 3% BSA-PBS) overnight at 4°C. A HRP-conjugated anti-rabbit was used as the secondary antibody, followed by colorimetric detection using a DAB kit. Tissues were counterstained with hematoxylin and dehydrated with ethanol and xylene to prep for mounting. Publishing research using ab5802? Please let us know so that we can cite the reference in this datasheet. There are currently no Customer reviews or Questions for ab5802.